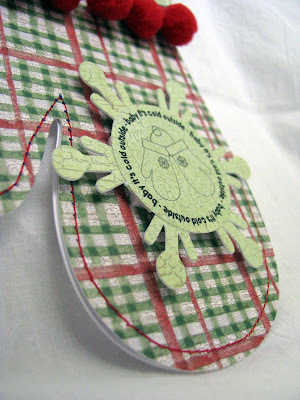 Scrappin' with DeeDee: Baby It's Cold Outside! Well it's not really COLD outside yet, but it sure has been chilly here in Texas! A few mornings I could have used a pair of mittens while I was driving to work though! 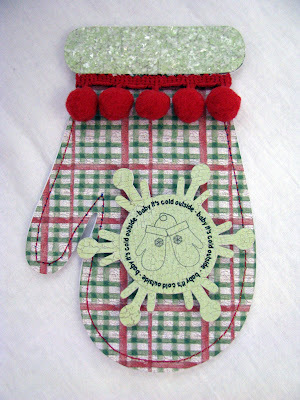 This is the new Mitten Shaped Card that was recently released over at The Cutting Cafe'. Isn't is the cutest? The sweet little sentiment in the center of the snowflake is also from a new set of stamps from The Cutting Cafe' as well. This set is called Christmas All Around. I love this set! I added some Martha Stewart "snow" glitter to the cuff, stitched around the outer edge of the entire mitten and then added some red pom-pom trim to finish it off. Oh, I almost forgot to say I cut the snowflake out using my new Winter Woodland Cricut cartridge that I got from Hallmark Scrapbook. THANKS for zooming by to see me today. Be sure to sign up for my blog candy giveaway on yesterday's post. See ya next time! HUGS! Wow I'm first today...is there any hot chocolate to go with the mitten? I just love this, it will make a great winter card! I love that stamp. I'm a newbie, who is TTC? LOL! Sorry Ladies, it's Winter Woodland....typo, I fixed it! Hee hee hee! So cute, love the little red pompom trim. 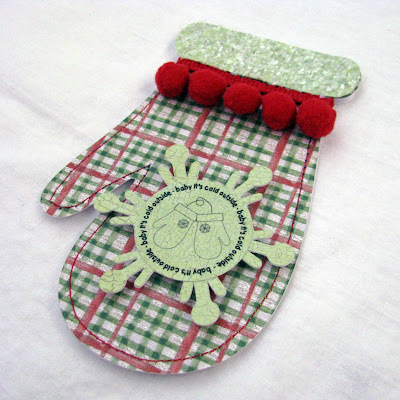 Such an adorable mitten card! You've embellished it beautifully, DeeDee!!! love the paper you used and that pom pom trim is perfect for it! GREAT card, ladybug! hugs! you did good girl. i wish i was as good at this as you ladies. i just started using my cricut,etc...i do not have that cartridge, but would love to own it.